Single cut teeth for sharpening round-hooded chain saw teeth. Safe point and efficient tooth desi..
Half Round 2nd Cut File 150mm / 6"
6 piece Needle file set with high carbon blade for strength and durability. 160mm Lenght 1 Flat ..
To Suit Files 4" To 6"..
To suit Files 6" to 8"..
To suit files 8" to 10".. 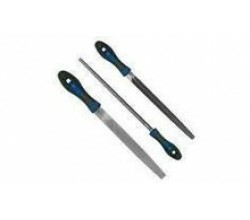 Round File 2nd Cut 150mm / 6"
Warding File Round 100mm / 4"